Situated on a rise overlooking the city and harbor, this hotel is 3 blocks from Government Street, 3 blocks from the Royal BC Museum, and 4 blocks from Beacon Hill Park. This family-friendly Victoria hotel is located in the entertainment district, within a 10-minute walk of Lower Johnson Street and Save-On-Foods Memorial Centre. Victoria Harbour and Royal BC Museum are also within 1 mi (2 km). Facing the Inner Harbour and adjacent to the Parliament Buildings, Hotel Grand Pacific is 2 blocks from the shops along Government Street and 5 blocks from Fisherman's Wharf. Located on the inner waterfront overlooking downtown Victoria, this resort hotel is 2 blocks from shops and restaurants along Market Square; Chinatown is 3 blocks away. This hotel overlooks the Inner Harbour, within steps of shop-lined Government Street and the copper-domed Parliament Buildings, and three blocks from the Maritime Museum. 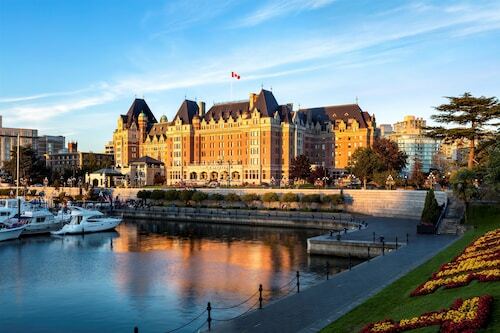 Located in Downtown Victoria, this hotel is within a 10-minute walk of Victoria Conference Centre and Victoria Harbour. Victoria Clipper Ferry Terminal and Sidney-Washington State Ferry Terminal are also within 20 mi (32 km). Overlooking Victoria's inner harbor, the condominium-style Victoria Regent Waterfront Hotel & Suites has a private dock; restaurants and nightlife surround the hotel, and many city attractions are less than 1 km (1 mi) away. Located two blocks from Victoria's busy Inner Harbour, the European-style The Magnolia Hotel And Spa is one block from Government Street shops and three blocks from the Royal BC Museum.